The United States has unleashed a number of sanctions as well as punitive measures against Russia amidst allegations it engaged in cyber hacking during the recent presidential campaign in the U.S. This action put pressure on U.S. president-elect Donald Trump not to lift the sanctions after taking office on January 20. The government of Russia threatened some type of retaliation and has continued denying the accusations made by the U.S. that it hacked as well as stole emails in an attempt to help Trump to victory. Trump said U.S. officials should move forward, but as a sign he might not be completely brushing the allegations off, he planned a meeting with leaders of U.S. intelligence next week so he can learn more. One month following an election that the U.S. said Russia attempted to sway to go in Trump’s favor, on Thursday President Obama sanctioned the FSB and GRU, the leading intelligence agencies in Russia that the U.S. claims were involved. In a response elaborately coordinated by five or more federal agencies, the White House administration sought to expose the cyber tactics of Russia with a report that was detailed and hinted it could still launch its own covert counter measure. Obama said the U.S. response was not complete and that it could take further action that could be covert, which was a thinly veiled threat to a counterstrike via cyberspace that was being considered by the U.S. However, Trump could easily pull back the sanction when he takes office. He has insisted that Democrats and Obama are only trying to delegitimize his win in the election. At the same time, Dmitry Medvedev the Prime Minister of Russia charged that the White House is immersed in anti-Russia death throes. The Prime Minister, who focused on the improving of ties between the U.S. and Russia from 2008 to 2012 while president of Russia, has called this new diplomatic breach a sad one in a post on Twitter Friday morning. Part of the sanctions leveled against Russia was the kicking out by U.S. officials of 35 diplomats from Russia in response to the harassment by Russia of U.S. diplomats. In addition, Russian recreational areas in Maryland and New York were shuttered. The U.S. says those compounds were used by intelligence agencies from Russia. 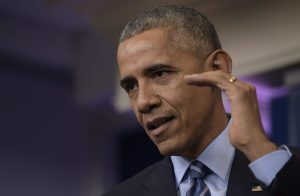 This was the strongest action taken by the Obama administration to date in retaliation for the cyberattack and was more comprehensive that sanctions imposed last year on North Korea following its hack of Sony Pictures.